Great interview about David Archuleta in Guatemala – The English translation is a little broken but you will find them thoroughly enjoyable. It’s a glowing review about our David. EpicDemia. I know it seems odd to see an article by a pop star here in EpicDemia. música. The truth is that we have spent much of the niche of heavy metal in recent months, but that does not mean that we are not open to appreciate all branches of music. If you look in our library, you’ll see that we have covered earlier artists from other genres. Anyway, last night we had the opportunity to live with one of the most talented pop stars of our time: David Archuleta. For if you are one of the few who do not know, David Archuleta achieved fame by being second in American Idol, in 2008. After that, his fame grew exponentially. The first single from his album David Archuleta, entitled “Crush,” reached second place in Billboard. What is so impressive about this is that the young man barely 19 years of age is now not only has a voice that would embarrass the 90% of the current singers, but does so after having suffered partial paralysis in the vocal cords. Archuleta is on a tour with his mother, Lupe, to reach out to poor communities in America. In Guatemala came through Mentors organization, dedicated to helping small entrepreneurs to take their businesses forward. 1. His message to young people is that they should always strive to move forward with their dreams and never being discouraged by the conditions under which they live. 2. As for his book Chords of Strength (Strings of Power) tells us that the reason for writing is to be a guide for young people to tell their experience, especially what you learned to have suffered vocal cord paralysis some years ago. It further attempts to encourage them to move on, to show how one can overcome adversity and succeed in what you propose. 3. He said the reason he sings is that this is the best way he knows how to express himself. He will be a positive influence for young people, and he feels there are too many negative songs with lyrics that leave nothing good, and that his intention is to provide good music that makes people feel good and that does not carry negative messages. The most impressive of the presentation was that David Archuleta sang a cappella for the media and we all realized the caliber of artist we had in front of us. 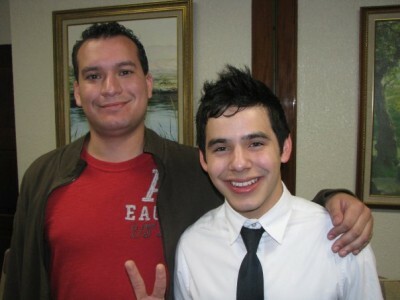 David Archuleta, with his namesake: I, David Morales. After that, we were taken to a room that was a kind of chatter, mixed with music. I should mention that all this took place in a chapel of The Church of Jesus Christ of Latter-day Saints and that David did not charge for their presence. In fact nobody had to pay to be at the meeting. The nature of the act was a little spiritual, so most of the songs were hymns selected by David Archuleta. The only exceptions were a piano presentation with the song “Angels” and another check for his mother “Mi Tierra”. Interestingly, he sang hymns in Spanish, despite having some difficulty speaking the language. It is interesting to see how the youth has not been perverted, despite having some time in the world of entertainment. Even admitted to being nervous several times during the night. No arrogance on his face looks, or how it is expressed. Moreover, during the press conference sought support from his mother when he was nervous. Do not know about you, but I’m used to artists who believe that fame gives them a superior status, and saw this star still has respect for his mother realized he was onto someone else. Part of the conference. We can see sorry, trying to speak Spanish. twitter. Meanwhile, I have fought for the fund to date their fans on twitter. Most strikingly, the day was not music, but when David had to speak. A member of the congregation of Latter-day Saints (Mormons), so that their main purpose was to God and his certainty that His Gospel is true, and how this has helped him in his life. Whether you believe in God or not, I assure you that when you listen to feel a sort of peace and tranquility. Not that he is the best orator in the world, in fact tends to wander a lot, but his fervent belief in what they believe and desire to do everything possible to help others without seeking recognition is something to behold. When I knew I was going to cover a story of David Archuleta, I thought I would be talking about his musical performances and powerful voice. Read what I’ve written and I realize that was not being much about it, but rather the impression I left as a human being. The success and fame have already met many artists, but what David Archuleta is the human being is something different, then has a genuine kindness, that of not seeing him in person could not understand. It is more inspired at the end of this event than anything else. That’s something I cannot say about another artist. Updated: ChiChi has kindly sent me the video that took a cappella interpretations of David with members of the press. Note that I cannot upload it on YouTube because we were told that the material was unique to the present there. Click on the video and wait for download. You need Quicktime to view.